Broadwoodside is an ancient place of settlement. In 1591 John Robeson of Broadwoodside was a juror at the trial of Agnes Sampson, the most infamous of the North Berwick witches, who was executed in Edinburgh for raising a storm against a ship in which King James VI was travelling. James became obsessed with the threat posed by witches and in 1597 wrote The Daemonologie which is thought to have inspired Shakespeare when he was writing Macbeth in about 1606. 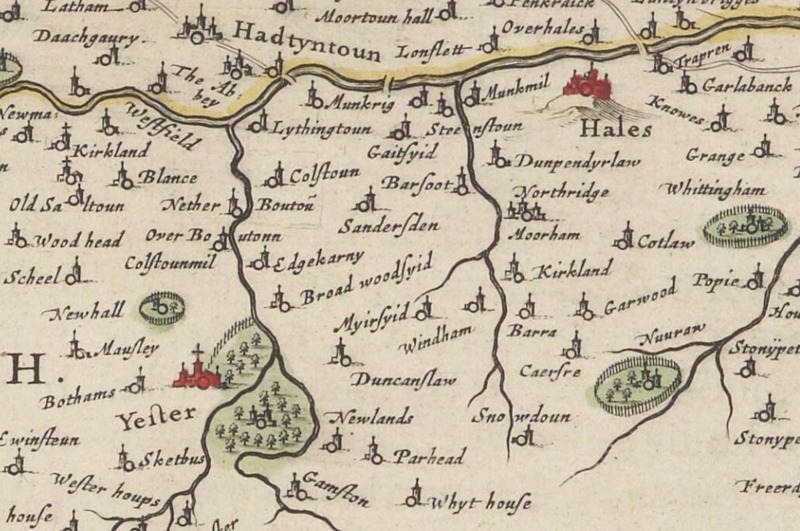 ‘Broadwoodsyid’ – but not Gifford – is shown on Blau's 1654 map of Scotland, effectively the first complete map of the country. Parts of the old farmhouse survive from this period: analysis of the lime mortar dates it to about 1680. As a part of the Yester estate, for centuries the farm was the property of the Tweeddale family. The 8th Marquess of Tweeddale (1787–1876), between fighting in the Napoleonic Wars and serving as Governor of Madras, set about the improvement of his farmland with characteristic energy. His achievements are recorded in The Yester Deep Plough Culture, published in Edinburgh in 1855, which records how ‘he led the way in tile-draining, in deep ploughing, and in other agricultural experiments, which he conducted at a considerable expense’. The dressed-stone engine house on the southern side of the steading dates from the arrival of steam threshing machines at around this time. Their brick chimneys remain a distinctive feature of rural East Lothian but here, although the large base can be seen, the smokestack is long gone.The 1871 census records twenty-three adults and children living on the farm. The estate accounts for Broadwoodside and Yester Mains, the home farm, show a profit of £2,682 in 1900, equivalent to about £300,000 today. Unlike most East Lothian farms in this prosperous period for agriculture there was never the need to build a substantial farmhouse, as the farm was ‘in hand’ at that time and not tenanted. The farm buildings at Broadwoodside remained modest, ancient and undisturbed. In 1967 the Yester estate was broken up, and the Bathgate family continued as tenants of the new owners. Old Mrs Bathgate lived on in the cottage above the willow pond – without electricity but with a pretty garden – until the mid-1990s. The farm was sold again in 1997 and the buildings were Grade-B listed in 1998. The photograph below shows the derelict steading in 1998, the site cleared prior to renovation. Broadwoodside was mentioned in the 2003 Civic Trust Awards; shortlisted for the Country Life / Savills Genius of Place Award in 2007; and selected as one of ‘The 50 Best Houses and Gardens’ by The Independent in 2012.